Darker colors on the map reflect a higher percentage of contributions for the candidate. View the full map here. 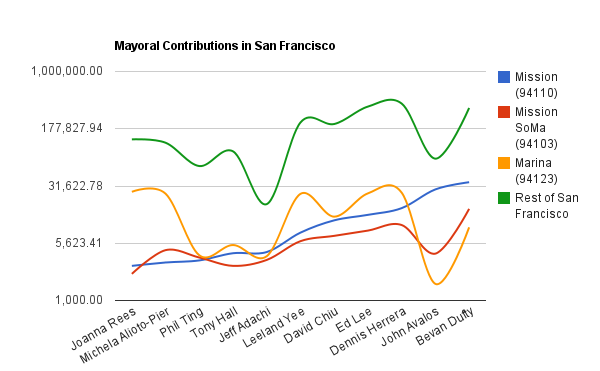 As the San Francisco mayor’s race enters its final month, candidates Dennis Herrera and Bevan Dufty have raked in the most cash to date. But a look at where 11 candidates are getting their money from across the city reflects different power centers behind each. The map above distributes cash contributions gained by candidates from San Francisco based on zip code, roughly corresponding to the city’s neighborhoods. It’s no surprise that District 11 Supervisor John Avalos has pulled most of his financial support from the Excelsior and the Mission, both with large Latino populations. In fact, 22 percent of Avalos’ funding — $24,114 — has come from the Mission, making him the second-largest recipient of funds from the city’s most populous district. But it is Dufty, a former supervisor for neighboring Castro and Noe Valley, who grabbed the most cash from Mission residents and businesses — $34,920. Dufty, who has been campaigning since 2009, shows solid financial support in the Castro and the neighboring districts of the Haight, Twin Peaks, the Mission and Noe Valley, with about $243,000 raised in those areas. California State Senator Leland Yee earned zero contributions from the Castro, but had a strong showing in the Richmond and Sunset, both districts with large Asian American populations. Those two districts, combined with the Marina — the district that offered the most cash overall — contributed a total of about $60,000 to Yee. District 3 Supervisor David Chiu also won strong financial support from the Sunset, as well as Mission Bay, Russian Hill and Pacific Heights, with about $58,000 from all four districts. Within his own district, however, his gains were slightly less lucrative — about $33,000. Assessor Phil Ting, who has raised only $338,400 even with public financing, received cash from pretty much every district in the city, but had his strongest showing in the Outer Richmond, the Sunset and Twin Peaks. Interim Mayor Ed Lee blasted into the race with about $744,000. That total is without public financing and with a late start. The Laurel Heights and Inner Richmond areas dished out the most cash to Lee, about $41,500. He also found contributors in most districts to the city’s west and north, and was the largest Chinatown beneficiary, at $17,100. Jeff Adachi, San Francisco’s public defender, has raised the least amount of cash to date, $89,000. Most of his contributions have come from the Mission, Outer Richmond, Pacific Heights and the Marina. In the Marina, the big cash raisers were Michela Alioto-Pier, a former District 2 supervisor; District Attorney Dennis Herrera; and Joanna Rees, a venture capitalist. Alioto-Pier raised most of her cash from the Marina, Pacific Heights, Laurel Heights, Twin Peaks and Outer Richmond. Rees barely raised any cash outside of the Marina and Laurel Heights. With $1.3 million, Herrera leads in total cash. He has broad financial support from across the city, but is particularly strong in the Marina, Mission Bay, Pacific Heights, Laurel Heights and Russian Hill. Herrera has raised $15,975 from the Mission — $3,250, or just over 20 percent, of which has come from attorneys or investigators who work for the City of San Francisco. Finally, Tony Hall had few financial gains throughout the city except for the Twin Peaks area, where he raised $23,100.